A quarterly Journal accessible through the members-only area of this website, containing articles, research, and classroom ideas as well as information on events and ELT issues in Greece. Please check below for the article submission guidelines. 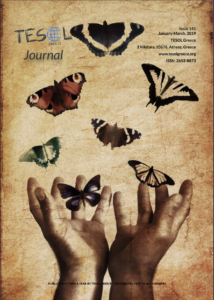 Content: The TESOL Greece Journal aims at promoting development and innovation in the field of ELT methodology and practices.Since the vast majority of our readership is teachers active in the field of ELT we encourage articles that have both a solid theoretical foundation and give advice and tips on practical matters. We cannot publish articles that aim at self-promotion, commercial promotion of materials or courses even those that are available for free. Submission of an article or any other type of writing does not guarantee publication. You may be asked to redraft your work in collaboration with the editorial team which takes time and your work might be selected for publication in a later issue. Although we prioritize original articles we will consider articles for a reprint (Please check Legal (8) below). Writing style. We encourage contributors to write in a clear and easy to read style as the journal is aimed at the novice as well as the more experienced readership. Format and Length: Please use Times New Roman, size 12 fonts, with 1.5 spacing. Optimal length is 1,400-1.600 words ~ 800 words for Special Interest Group (SIG) articles. Send your text and any photographs as an email attachment to: journaleditor@tesolgreece.org as a Microsoft Word document. Please do not send PDFs. References should be included at the bottom of your article in the following format; author(s), date of publication, Title in italic script, Place of Publication, Publisher or for electronic sources: Author/Editor. Year of publication. Title in italic script Place of publication: Publisher. Available from URL [Accessed date]. Biography. Please include a short biographical note of no more than 50 words as well as a recent full face colour photograph of over 500 kb in size. Abbreviations and Acronyms. Please spell these out in full the first time, capitalising the first letters, followed by the acronym in brackets, e.g. Teachers of English to Speakers of Other Languages (TESOL). Factual information: Please make sure that any factual information is correct. Please check your sources and if in doubt it would be better to leave it out. It is not up to the editorial team to check sources therefore the responsibility for any inaccuracies, dishonest or libellous materials lies solely on the writer. Legal: By submitting an article for publication we assume that your article/review has neither been previously published, nor is being considered for publication elsewhere. If that is not the case and you wish us to consider it for a reprint, we need to know where the article was first published and that you have obtained permission for that. The author must also obtain permission for reproducing any photos in their work. Deadlines: The TESOL Greece Journal is published four times a year in the first week of March, June, September and December. The deadlines for submission for each issue are at the end of the first week of the previous month each issue is published in. E.g. the deadline for the 2015 December issue is November 6th 2015. The editorial team reserves the right to modify or amend these guidelines as needed. The TESOL Greece Editorial Team.